Important Notice: To qualify for this membership you must be a 5-PATH® certified hypnotist. To be a member of 5-PATH® IAHP, you must have graduated from one of the Banyan Courses, including the 10-Day Certification Super-Course, the Week of Power 7-Day Course, or through our 5-PATH® distance learning course. 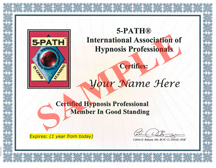 5-PATH® International Association of Hypnosis Professionals Membership - Certificate of Good Standing. Ability to use the emblem on your website and have it backed up by a link to our website where your credentials are explained, (which will show your potential clients and other professionals your elite status in the profession). 5-PATH® Hypnosis Directory (www.Hypnosis-Directory.com) Listing (non-members will be removed). Be able to have a web page listing in the 5-PATH® Hypnosis Directory (www.Hypnosis-Directory.com) Listing, (non-members will be removed). All new 5-PATH® graduates automatically become members and the first year's membership fee is included in their tuition. Together as members of the 5-PATH® IAHP we can build a better future for the profession, as we work with other organizations such as the National Guild of Hypnotists, National Federation of Hypnotists Union and the National Health Freedom Organization. We hope that all 5-PATHers® around the world will join our association and become members in good standing. For more information, email us or call our office at 469-969-2176 or 800-965-3390.